Diagnostics tests are essential to helping our patients feel better faster. They help us to decide whether a patient is on the correct type and dose of medication, and whether a previously diagnosed condition is well controlled. 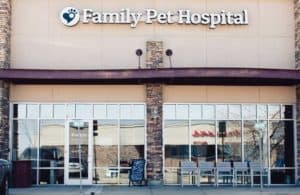 Accordingly, Family Pet Hospital in Longmont uses advanced technology to facilitate convenient preventative and surgical treatment. Sometimes waiting for 24 hours to a few days for these results can be difficult or dangerous. For these situations, getting answers right away is necessary, and can take the guesswork out of diagnosing and treatment. This is especially important in critical care cases where immediate treatment is necessary. That is why Family Pet Hospital has an array of advanced diagnostic technology such as state of the art blood and urine analyzers, a compound microscope, x-ray, and more. These capabilities allow us to have answers for our clients within 20-30 minutes of drawing a sample. Not waiting for results allows us to start treating what is wrong with your pet immediately, and in emergency situations, may be lifesaving. Family Pet Hospital’s technology provides a unique convenience for patients, clients, and medical staff. For example, we can test for proper dosing of patients who frequently take a medication (e.g. nonsteroidal anti-inflammatory medications to monitor liver/kidney function). The convenience of having in-house diagnostics can reduce the number of visits required, and this provides peace of mind for pet owners. In-house testing is important for our surgical patients too. We can perform same day “pre-anesthetic” bloodwork to assess the patient’s current health status, rule out conditions, and prepare for conditions that may cause potential complications such as anemia, diabetes, and electrolyte imbalances. Chemistry Analyzer – Our chemistry analyzer determines organ function to rule out diabetes, pancreatitis, thyroid and kidney disease. Urinalysis Analyzer – Our urinalysis analyzer uses advanced software to analyze urine samples. A urinalysis looks for kidney disease, urinary tract infections and diabetes. Xray – Our digital xray machine is used to diagnose orthopedic diseases, intestinal blockages, trauma, internal damage, and more. It takes only a few minutes to take the images and we see results immediately. Because it is digital, we can also send out images for telemedicine. Microscope – Our compound microscope is used to diagnose infections of the ear, and skin. We are able to rule out parasite infections, bacteria and yeast overgrowth, identify types of masses, and determine certain aspects of hematology. This method of diagnosis is immediate and convenient. This microscope also has a camera that shows “real time” images of what is being viewed and these images can be reviewed with pet owners.